Beginning about 1200 CE, the Mali, Songhay, and Ghana empires spread their sequential influence across the western horn of Africa, making advances in trade, language, culture, and economy. Influenced heavily by Islam in their later periods, these empires flourished and grew under a series of powerful leaders, including one, Mansa Musa, whose skills were celebrated in European capitals. 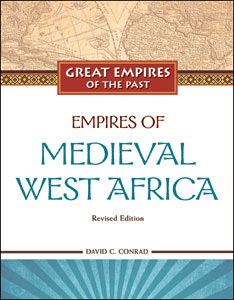 Empires of Medieval West Africa, Revised Edition discusses the vital role salt and other natural resources played in the development of the empires, the rich and diverse cultures, and the influence of the growing Islamic Empire on everyday life. Included are some transcriptions of the oral tradition that is, in many cases, the only record of the deeds and achievements of these peoples. Connections to life today include the continuing impact of Islam and tribal groups in today's Africa and the influence of the medieval traditions on modern music and cuisine. Full-color photographs and illustrations. Maps. Sidebars. Glossary. Bibliography. Chronology. Further resources. Index. David C. Conrad holds a Ph.D. from the University of London and is one of the foremost experts on medieval West Africa. Retired as professor of African history, he is a former Fulbright Scholar and Fellow of the Royal Geographic Society. Conrad returns to West Africa every year as a researcher and lecturer. His books include Sunjata: A West African Epic of the Mande People.